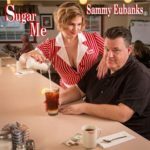 Sugar Me, Sammy Eubanks new album, kicks off with a little swampy and gritty guitar riff as he describes that what ever he’s listening to it’s “It’s All Blues to Me.” And it’s hard to argue as he explains how he was touched from first hearing BB King through his father and that led to further discoveries of artists that all rang true to him in a bluesy vein. It is an opening to a well-conceived collection of songs that shows Eubanks knows a little bit about the blues himself. A little bit? Hell, this man can bring it on home every time and with Sugar Me, his fifth release, he has it nailed down perfectly. Eubanks has long been renowned throughout the Northwest and beyond for his tasty guitar work, clever songwriting, and a voice that has few equals. All three are expressive and impassioned. Sugar Me was recorded in Nashville and is his debut on the Underworld label. The disc offers three original tracks, including the opening “All Blues To Me,” along with the title number “Sugar Me” and the closing piece “I’m Gonna Leave You.” Along the way he covers a wide variety of songwriters, including well-known people such as Willie Dixon and Don Robey alongside others like Los Lobos’ Cesar Rosas, Indigenious’ guitarist Mato Nanji, and Portland-based DK Stewart. Backed by a great rhythm section of bassist Darren Theriault and drummer Chris Kimmerer that enhances the openings for Eubanks’ guitar solos, the trio is also joined by former Double Trouble keyboardist Reese Wynans. Guitarists Bob Britt and Matt Hauer add their accompanying licks. Together this group of players is known at Underworld Records as “The Club Roar Players,” a spot-on collection of ace musicians. There’s so much to like about Sugar Me. It is Sammy Eubanks at his very best. This is one that has repeat play all over it … again and again!